But that’s where I found it, specifically atop a salad. Ballparks are where we eat hot dogs, but hot dogs have been off my menu since my angioplasty two years ago. That makes going to a baseball game much less fun for me than it once was. I usually can scrounge up a chicken breast sandwich now. The size of the salmon was adequate for the size salad. The price was something like $12, ballpark prices but ok. 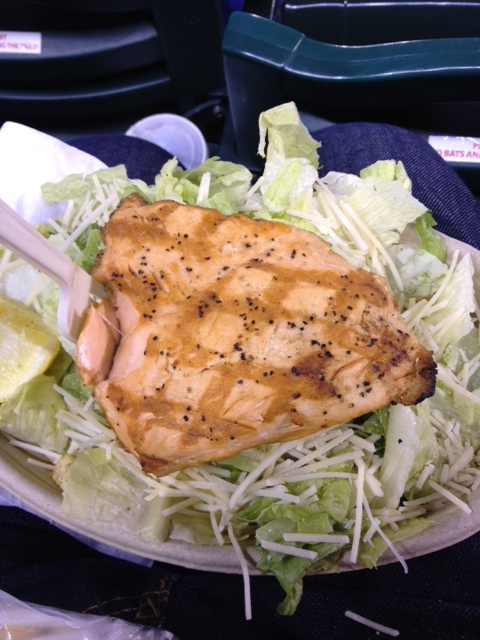 The salmon itself was average tasting but pleasant for ballpark fare. I had my own oil and vinegar so I didn’t use the high-fat, high-salt Caesar dressing that normally would have come with the salad. 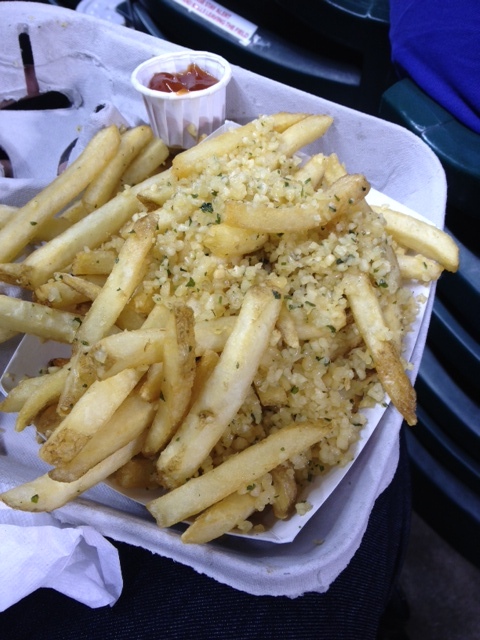 Splurge on the garlic fries at Safeco Field. They were a garlic-lover’s dream. Why not splurge with a hot dog? Well, I take my splurges sparingly these days and I had another in mind for this trip, a friend who lives in Seattle and came to the game with us had told us about something called garlic fries that also are sold at the park. As a garlic lover I had to try these and I was not disappointed. Fries came buried in mountains of chopped up garlic. If you love garlic try these next time you’re in Seattle. I ate a few as a splurge and loved them. I wouldn’t mind eating that salmon. It looks very tasty and extra special! It was, if course I had my own oil and vinegar for it so I avoided the high day dressing.